Ask The Macro Manager: What Is The Thermic Effect Of Food? Your body doesn't just burn calories during exercise, it does it during digestion too. Learn more about the thermic effect. What the heck is the thermic effect of food, how big of an impact does it have, and can I harness it to work for me as I try to build lean mass? The thermic effect of food is the caloric cost of digesting and processing different macronutrients in your diet. There is evidence that scientists have known about this phenomenon since the early 1900s. Amazingly, despite what we could consider greatly antiquated methods, researchers over 75 years ago were able to accurately determine the different thermic effects of each of the different macronutrients. "IF you eat 200 calories worth of protein, your body will use between 40 and 70 of them in digestion." To put this in tangible terms, if you eat 200 calories worth of protein, your body will use between 40 and 70 of them in digestion. The most common estimate for the total thermic effect of food is around 10 percent of your total caloric intake, but as your protein intake increases so does this number. The thermic effect of food should be particularly of interest to hardgainers or anyone trying to add mass. Hardgainers are generally metabolically inefficient, meaning their bodies burn off excessive amounts of calories as heat—and thus not for processes like muscle-building. 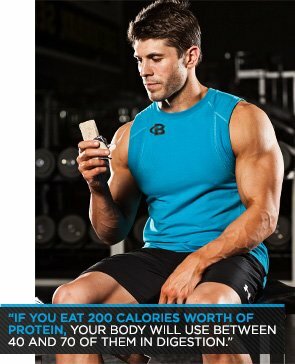 This requires them to eat even more than their non-hardgainer counterparts in order to put the same number of calories effectively to use. A struggling hardgainer eating 3,300 calories per day on a 40/30/30 protein/carb/fat breakdown could be burning off as much as 365 calories due to the thermic effect of food. That is a significant chunk of calories. Accounting for these caloric losses can make life less frustrating, because it provides a more accurate picture of the calories being directed toward muscle-building efforts. Since protein has a thermic effect upward of five times greater than carbohydrates or fat, the additional calories you put into your diet to make up for this gap should come from carbohydrates, fats or both. This will minimize the thermic consumption. The thermic effect of food is the caloric cost of digesting and processing different macronutrients. Protein has a thermic effect upward of five times greater than carbohydrates or fat. Other factors affect the thermic effect of food in ways which could be of great interest to hardgainers and anyone else who tracks and strategizes their macro intake. These are exercise and body composition. People who are lean have been shown to experience a greater thermic effect, although there&apos;s no clear consensus on how much. Likewise, the thermic effect of food jumps post-exercise, but again, since this is tied to body composition, exercise duration, and intensity, it is difficult to give a clear estimate of how much. So what&apos;s the takeaway? If you add extra calories during the post-workout window to take advantage of insulin sensitivity, it may work against you to some degree if your goal is to build mass. To counteract this increase in the thermic effect of food, consider adding fat or carbohydrate calories strategically outside of the post-workout window.